With a range of trim levels available, as well as three and five-door versions of the MINI Hatch, there truly is a model to suit every driver. 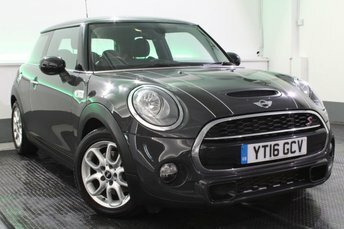 You'll be able to find a great selection of used MINI Hatch Cooper models for sale in Bolton right here at JCT4 Automotive. We are a leading supplier of quality and affordable used vehicles and you can trust our team to provide you with reliable and impartial guidance. Take the opportunity to view our complete stock online and be sure to pay a visit to the showroom in person when you're ready to take a test drive. Finance is available to UK residents aged 18 years or older, subject to status. Terms & Conditions apply. Indemnities may be required. Other finance offers may be available but cannot be used in conjunction with this offer. We work with a number of carefully selected credit providers who may be able to offer you finance for your purchase, commission may be received. We are only able to offer finance products from these providers. Postal Address: JCT4 Automotive, Unit 9, Glebe Road, Skelmersdale, Lancashire WN8 9JP, find contact details here. JCT4 Automotive is authorised and regulated by the Financial Conduct Authority, FRN: 772238. All finance is subject to status and income. Written Quotation on request. We act as a credit broker not a lender. We work with a number of carefully selected credit providers who may be able to offer you finance for your purchase. We are only able to offer finance products from these providers.